In the paper, various laboratory pyrolytic methods were used to evaluate selected petroleum source rocks. The methods used are: Rock–Eval pyrolysis, Py–GC pyrolytic technique and TG/DTG/DSC. The experiments of the last method were performed according to three different procedures. Each of them provided different, specific data. The selected rock sample material was diversified in terms of stratigraphical position, structural unit and place of collection (outcrop or borehole). Based on the Rock–Eval analysis results, kerogen in samples can be classified as type II. Additional information on the quality of pyrolysis products was obtained from the Py–GC analysis. Thanks to the combination of the all three implemented pyrolytic techniques, the quality of the generation potential of the source rocks can be evaluated in details. In some samples, the oxidation and pyrolysis of organic matter occur in two stages, what is the evidence of the complex nature of the organic substance. The maximum of pyrolysis reaction is detected by TG/DTG measurement in the range of temperature from 450 to 580 °C, depending on the maturity of organic matter. The maturity level increases with the rock stratigraphic position. The proportions of loss in mass observed in respective stages of pyrolysis in course of TG/DTG experiment are in correspondence with the observations of the released fractions in the Py–GC analysis. The Carpathian Menilite shales could be classified as source rocks with high oil generation potential. Also, the Lower Silurian and Ordovician shales are characterized by high oil-producing potential with a lower content of mineral matter. Cambrian rocks show a different character and gas-prone generation potential. Source rock is one of the main elements of petroleum system. Therefore, to estimate the petroleum resources, it is necessary to investigate the source rock and its characteristics first. In order to evaluate the source rocks, various laboratory methods are used. Among these techniques, Rock–Eval pyrolysis has been widely used in the industry, as a standard method in petroleum exploration. The nature of organic matter, dispersed within fine-grained rocks, is related to both the age of the strata and depositional environment conditions, as well as subsequent diagenetic processes. All of these factors determine the generation potential to hydrocarbons. The aim of the research was detailed characteristic of the examined rocks, regarding their thermal decomposition, which could inform about the generation potential depending on the temperature and energy release. It is assumed that the total loss of mass of the sample during its heating in the range corresponding to the decomposition of organic matter is closely related to the presence of hydrocarbons in the rock, and the value of the maximum temperature of decomposition depends on the maturity of organic matter. The Rock–Eval pyrolysis is the most basic method of organic geochemical analysis of sediments. It is based on a steady heating of rock samples to release hydrocarbons which had been already generated in the formation and are stored in pores of the rock, as well as newly produced hydrocarbons by the thermal breakdown of kerogen. The hydrocarbons already present in the sample are represented by indicator S1, while those produced during pyrolysis by indicator S2. The relative amounts of S1 and S2 are dependent on the type of organic matter and on the thermal energy (time and temperature); the rock has already gone through in the subsurface . The temperature corresponding to the maximum production of hydrocarbons during pyrolysis of the kerogen (Tmax) gives an indication of maturity of the studied organic matter. In general, Tmax values lower than 435 °C indicate immature organic matter. Tmax values between 435 and 455 °C indicate “oil window” conditions (mature organic matter). Values between 455 and 470 °C are considered transitional. Tmax higher than 470 °C represents the wet-gas zone and overmature organic matter [2, 3]. Py–GC system is an additional pyrolytic technique for the rapid evaluation of potential source rocks. It was used in presented work for determination of hydrocarbon production by gas chromatographic (GC) analysis of the thermal extracts and pyrolysis products of rock samples. The product type is recognized qualitatively by GC fingerprint traces or quantitatively by hydrocarbon composition (C1 to C9, C9 to C15, C15+) from the rock pyrolysate. Oil-prone rocks are recognized by GC traces with a full spectrum of C1 to C28 hydrocarbons, or by high concentrations of C15+ compounds. In contrast, gas-prone kerogens are characterized by the predominance of light hydrocarbons from C1 to C4 and higher contributions of aromatic compounds. Mixed-type production is intermediate in character between the two mentioned. Thermogravimetric (TG) and differential scanning calorimetry (DSC) methods are a powerful group of analytical methods, providing additional information on the mineral and organic matter content in the sample. The shapes and peaks of curves obtained from thermal analysis are indicators of the composition and structure of the organic matter in the sample. The temperature range over which the reactions take place is a function of the bonding energies of the various functional groups or other structural elements within the matrix . The application of TG/DTA methods in air atmosphere to study organic matter in sedimentary rocks was developed extensively in the 1970’s. In the next decades, thermal analysis was broadly used for the investigation of petroleum products , as well as coal and organic matter contained rocks . Also DSC technique was used for organic matter recognition in oil shales or kerogen evaluation in source rocks [6, 7, 8, 9, 10]. In most cases, the kerogen is separated from the rock , but some attempts to examine bulk rock were also undertaken [12, 13]. The vast majority of up-to-date research was focused on oil shale [11, 14], while relatively little research was concerned on gas shale and hydrocarbon source rocks . Petroleum source rock is fine-grained sediment, containing organic matter, commonly shales or lime mudstones. The main analytical problem is organic matter dispersion within the rock matrix, which, on the one hand, makes it difficult to examine the organics; on the other hand, it requires the consideration of the mineral components of the rock, as they have a significant influence on the kerogen decomposition. 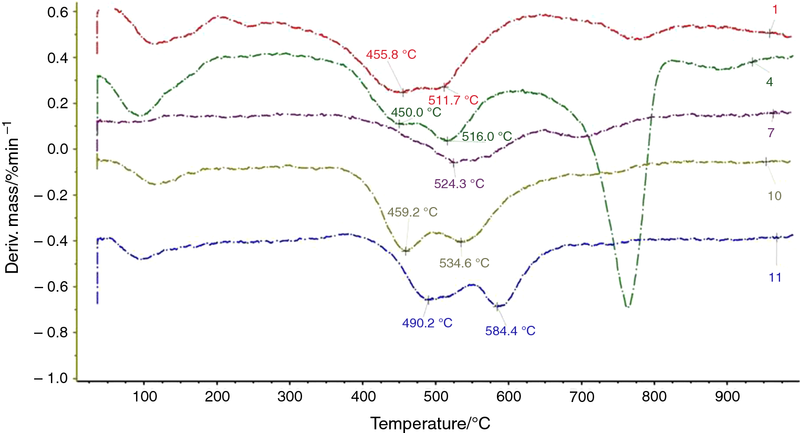 In this paper, some attempts were made to correlate the results obtained from the Rock–Eval pyrolysis, Py–GC pyrolytic technique and TG/DSC for complete characterisation of fine-grained rocks containing organic matter. Due to the fact that we had a diversified research material—the samples varies in terms of stratigraphy, structural unit and place of collection (outcrop or borehole sample)—it is possible to compare the results obtained in the aspect of all these factors. The examined 11 rock samples represent shales and mudstones from outcrops or deep holes from different geological regions of Poland. Within Lower Paleozoic rocks from deep holes, located in Baltic Syneclise in Poland, samples 10 and 11 are Upper Cambrian shales, samples 8 and 9 are from Upper Ordovician Sasino Formation, samples 6 and 7 represent Lower Silurian Jantar Member, sample 5 is Upper Silurian shale. Samples 1–4 were taken from the outcrops and represent Carpathian Krosno Beds and Menilite Beds of Silesia and Magura units (Table 1). The Rock–Eval analysis was performed in Oil and Gas Institute—National Research Institute (O&GI-NRI), with the Rock–Eval-6 standard model on whole-rock samples, which were grinded in agate mortar to < 0.02 mm grain size. At the first stage, the pyrolysis was run under inert (nitrogen) atmosphere in temperature range from 300 to 650 °C, at 25 °C min−1, to release kerogen-bound hydrocarbons, and oxygen-containing compounds. At the next stage, the sample was combusted in oxidation atmosphere, at 20 °C min−1, from 300 to 850 °C. The released combustion products (CO2 and CO) were analysed by IR detector. Additionally, the new research method was used, which was pyrolysis gas chromatography (Py–GC), applied to determine organic compounds generated by rocks. The apparatus used was Multi-Shot Pyrolizer EGA/PY-3030D by Frontier Laboratories, coupled with gas chromatograph GC-2010 Plus by Shimadzu, equipped with flame ionization detector (FID). Py–GC analyses were performed in Oil and Gas Institute—National Research Institute (O&GI-NRI) in Cracow (Poland). In the system, before entering the chromatographic column, a cryogenic trap, cooled with liquid nitrogen, is installed, due to the combination of the MicroJet Cryo-Trap MJT-1030Ex trap. The amount of sample depends on its type and should be adjusted to the technical parameters of chromatography column, detector and pyrolyser. The pyrolysis process is the most effective when using small amounts of sample. In the case of analyses of organic matter-rich material (e.g. bituminous extract, asphaltene fraction), the amounts of the sample should range from 0.1 to 1.0 mg; in the case of kerogen its quantity should be up to 3 mg, while the amount of rock samples should be about 10 mg. Sample is pyrolysed in pyrolysis oven under helium atmosphere at programmed temperature (e.g. 650 °C during 0.4 min). Products of thermal decomposition of analysed sample are collected in cryogenic trap, next send to gas chromatography column and analysed using FID detector. Cryogenic trap and gas chromatography column are connected by dispenser, which temperature is 250 °C. The parameters of chromatography analysis are as follows: capillary column Ultra Alloy-5 of 30.0 m length, 0.25 mm inner diameter, 025 μm film thickness, carrier gas (helium) of constant flow speed 1.98 mL min−1, temperature of FID detector: 360 °C, temperature programme: 30 °C–5 min, temperature gradient 10 °C min−1 to 360 °C, and isothermal stage at 360 °C–10 min, split 10:1. Procedure I Heating with constant rate of 10 °C min−1 in the temperature range of 40–1050 °C under oxidising atmosphere. Procedure II Heating with constant rate of 10 °C min−1 in the temperature range of 40–1050 °C under inert atmosphere. Isothermal stage on the constant temperature of 300 °C (20 min). Isothermal stage on the constant temperature of 650 °C (20 min). Heating up to 1050 °C (10 °C min−1). The results of Rock–Eval analysis are presented in Table 1. The first four samples (1–4) represent shales from Carpathian outcrops which are characterized by low maturity. Free hydrocarbons content indicated by value S1 varies from 0.14 to 0.29 mg HC g−1 rock. Hydrocarbon-generating potential (S2) for these samples varies from 12.0 to 23.29 mg HC g−1 rock. S2 peak is a result of the second stage of pyrolysis, when cracking of the kerogen and heavy hydrocarbons occurs. The amount of organic matter, expressed by the TOC value, ranges from 4.09 to 6.91. The amount of inorganic carbon (MINC) in Carpathian immature shales samples ranges from 0.25 to 2.55%. The ratio of HI values (hydrogen index) to Tmax indicates that most of the Carpathian samples contain oil-prone type II kerogen. The next set of the samples were taken from the bore holes and represent dark and grey shales of lower Paleozoic sequences. They stand out for their high-level maturity. That means that part of primary hydrocarbon potential was evolved. S2 represents residual hydrocarbon-generating potential for these samples and varies from 5.68 to 19.69 mg HC g−1 rock. This parameter indicates that these samples are also very good source rocks. One of the samples out of Paleozoic rocks (Upper Silurian sample 5) differs from the others by very low content of TOC and lack of generating potential. In case of very low organic matter contents, when S2 value is lower than 2 mg HC g−1 rock, this peak is too low for a substantial evaluation of the Tmax . Not taking into account the mentioned sample 5, we can state that all the examined rocks from outcrops are thermally immature (Tmax < 435 °C), whereas Paleozoic samples, mainly 6, 7, 9 and 11, seem to be thermally mature (Tmax in the range between 435 and 455 °C). The results of TG/DSC analysis are given in a graphical form as plots of TG and DSC curves in a function of temperature or time. Below are presented plots for sample 2, as an example. The results obtained for all examined samples in Procedures I and II are given in Table 2. The temperature range for each of the reaction is given, and in most cases, based on DTG curves, the temperature of maximum reaction rate is in brackets. 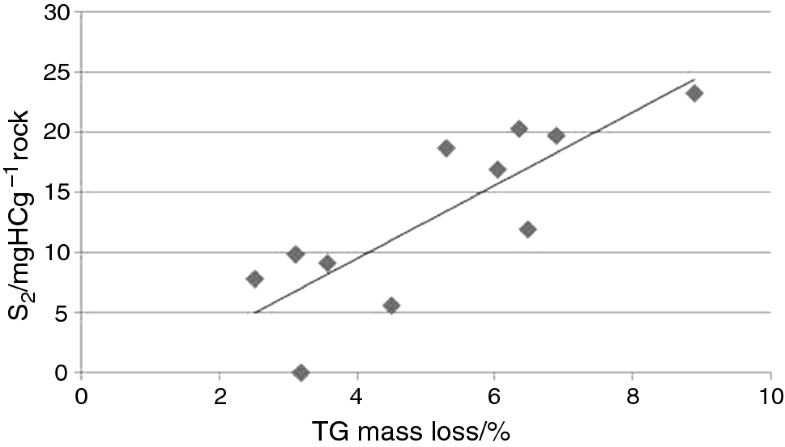 Most of the reactions are connected to the mass loss, which is determined on TG curves. The results of TG/DSC analysis were interpreted based on Földvári  and Yariv . All the samples were analysed under dynamic oxidising (synthetic air) atmosphere in the temperature range of 40–1050 °C. The simultaneous thermal analysis enables obtaining of TG and DSC curves on the common diagram (Fig. 1). TG curve shows the change in mass of a material as a function of time over a temperature range. DTG is a first derivative of TG, providing the rate of mass change. DSC measures the difference in energy input required to maintain the sample and reference cells at the same temperature. The DSC curve shows the amount of heat applied, as a function of temperature or time. The example of the result of the measurement in Procedure I is shown in Fig. 1. The mass loss on TG curve is of three steps in case of sample 2. The first step, between 40 and 237 °C, is due to clay minerals dehydration. The maximum of the reaction falls on 107 °C, which is indicated in DTG curve. The mass loss connected with this reaction is 2.57% of the sample mass. The second reaction is exothermal, what is visible as positive double peak on DSC curve. Hence, we can see that the organic matter combustion occurs in two stages between 237 and 625 °C (maxima: 344, 437 °C), with total mass loss of 10.32%. The next reaction is endothermic (negative peak on DSC curve), related to carbonate (CaCO3) decomposition. The mass loss results from the release of CO2 into the atmosphere and is 4.65%. The maximum of this reaction is visible in DTG curve, and it falls on 756 °C. 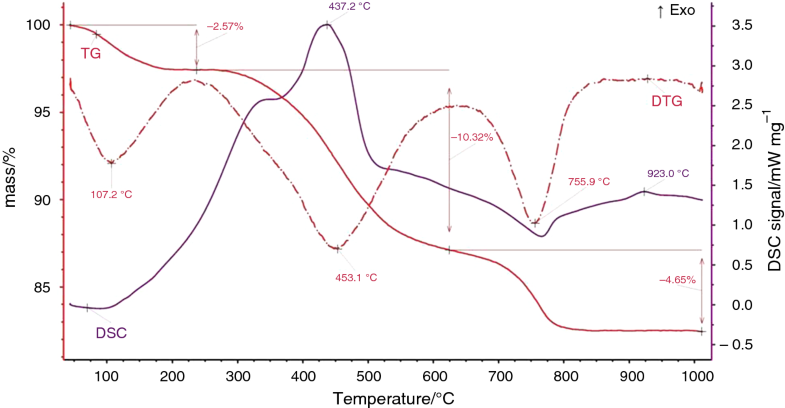 In temperature of 923 °C on DSC curve is noticeable an exothermic effect, not connected to the mass change in the sample. This indicates spinel phases synthesis, as a consequence of clay minerals decomposition. All of the observed reactions in the examined samples are presented in Table 2. The detected phases include clay minerals (including chlorites), micas (muscovite), carbonates (calcite) and organic matter. Some problem with interpretation of curves is the separation of the organic matter combustion and the decomposition of pyrite, which is present in some organic-rich rocks. This problem could be solved to some extend with help of TG/DTG/DSC experiment under inert atmosphere . In the second procedure of TG/DTG/DSC experiment, the samples were heated with constant rate of 10 °C min−1 under inert atmosphere. In this case the organic matter dispersed in rock is not combusted, but pyrolysed instead. The results (Fig. 2) are shown on the example of the same sample (2) as before (Fig. 1). The first reaction visible in the graph is clay minerals dehydration, with maximum falling on 116 °C, which is indicated in DTG curve. The second reaction is endothermic, what is visible as a weak negative (downwards) peak on DSC curve. This effect corresponds to the double peak on the DTG curve, indicating that the pyrolysis proceeds in two steps. Total mass loss of pyrolysis reaction is 7.76%. The next reaction is endothermic (negative peak on DSC curve), related to calcite decomposition. The maximum of the reaction rate falls on 759 °C. When comparing with the mass loss of calcite decomposition in case of the Procedure I of the experiment, it can be noticed the mass difference, which is probably connected to overlapping reaction of pyrite disproportion. In the experiment of Procedure II, any effect of spinel phases synthesis is not visible. The overlapping of the reactions of calcite and pyrite decomposition is also possible in case of samples 3 and 4. For samples 7 and 9, the endothermic effect of pyrite decomposition is overlapping clay minerals dehydroxylation (Table 2). In this procedure, the complex heating programme, close to the Rock–Eval pyrolysis analysis, was implemented. Figure 3 shows TG and DSC curves in a function of time. Temperature curve is drown with dotted line. Due to the use of isothermal intervals in the heating programme, the average heating rate is lower than in procedure II. As a result, the temperature ranges of the detected reactions are usually lower in procedure III. In case of the example sample 2, the maximum rate of calcite decomposition falls into 759 °C under constant heating regime, and on 751 °C under interval heating. As it is visible in Fig. 3, it is easy in this procedure to detect mass changes in each of the heating stages. If we consider sample 2, the mass losses are as follows: 4.42% in temperature range 40–300 °C; 6.48% in range of 300–650 °C, and 5.94% in range of 650–1050 °C. Due to the decomposition of organic matter, the most interesting is the interval from 300 to 650 °C, which could be compared to S2 obtained from Rock–Eval analysis. Marshall et al. indicate the possibility of comparing Rock–Eval pyrolysis results (including S1 and S2) with data obtained from thermogravimetric analysis of separated kerogen, in a range of 300 to 500 °C for S2. They find a significant correlation between S2 values obtained by pyrolytic and thermogravimetric methods, as well as a high correlation coefficient between S2 from TG and aliphatic carbon in samples. In case of our examination, the bulk samples were examined by TG analysis; hence, such a high correlation coefficient, as found by Marshall et al. , should not be expected. Rock–Eval S2 parameter was compared to the mass loss (from Procedure III measurement) during second dynamic heating interval (300–650 °C) (Fig. 4). 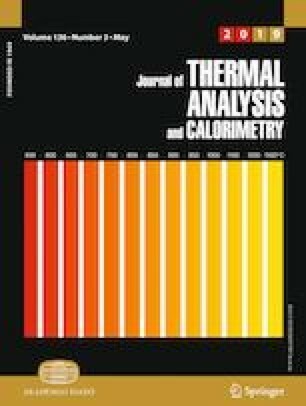 A weak correlation was found between Rock–Eval pyrolysis S2 and TG mass loss in heating interval 300–650 °C (R2 = 0.6843). The reason is that within the bulk rock sample many reactions occur in a given temperature range that affect the loss of mass. These reactions (under inert atmosphere) include pyrite decomposition, clay minerals dehydroxylation, and the first stage of carbonates decomposition. To examine this relationship, the TG mass loss (within interval 300–650 °C) in subsequent analytical procedures (I–III) with S2 from pyrolysis is summarized in Table 3. For the corresponding comparison of these data, parameter S2 was converted into %. 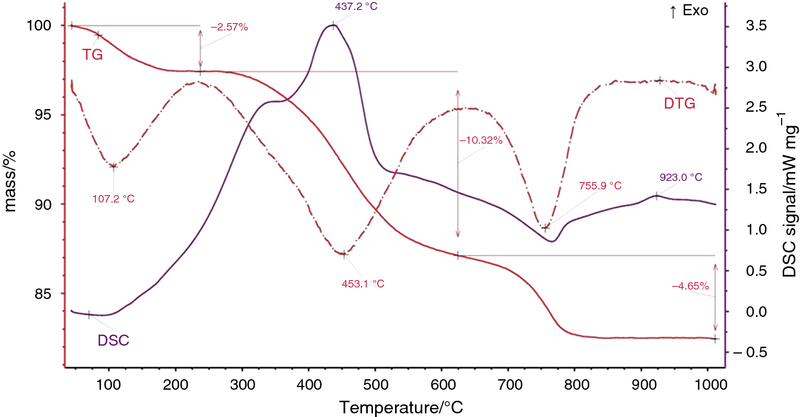 TG mass loss under oxidation conditions (TGI) in the temperature range of 300–650 °C is connected to the organic matter combustion and in some cases to pyrite decomposition. The high value of TGI indicates high organic matter content (as in case of samples: 1, 2, 3, 4, 6, 10), what is confirmed by high S2 value. The mass loss under inert atmosphere differs between the two described above procedures (TGII and TGIII) in a consequence of different heating programmes. The values of TGII are usually higher than TGIII, because of the presence of isothermal intervals in the heating programme in Procedure III. During these intervals, the mass of the sample decreases slightly, but the loss is not measured, as it is visible in Fig. 3, which is the weakness of Procedure III. This procedure is, however, taken into account when comparing the results of thermogravimetric measurement and Rock–Eval analysis, as it corresponds to the Rock–Eval heating regime. S2 value is here (Table 3) expressed as a percentage corresponding to the HC present in the rock. The difference between S2 [%] and TGIII is the decomposition of other compounds in the sample (e.g. pyrite, calcite, chlorite). For representative samples from particular stratigraphic levels, Py–GC analysis was performed in five temperature ranges in order to determine qualitatively the pyrolysis products, which will allow predicting the type of hydrocarbons generated in the process of thermal evolution of source rocks. The fractional composition also allows to distinguish gas-prone versus oil-prone types of generation potential. Among the analysed rock samples, the Menilite samples are clearly distinguished by a high content of the C15+ fraction, especially in the temperature range of 300–500 °C (Table 4). Above 500 °C, the dominance of light hydrocarbons is observed, as in all other samples. In the Lower Silurian shale (sample 6) in the 300–400 °C range, the largest share is C15+, while in the Upper Cambrian formations, the C15+ fraction is formed mainly in the range up to 300 °C. At higher temperatures, the predominant products are light hydrocarbons. The above observations indicate a high qualitative diversity of the generation potential of individual shale formations. The variability tendency is analogous to the variation of the HI parameter in the Rock–Eval analysis. This means that Menilite shales should be classified as source rocks with high oil generation potential. Similarly, the Lower Silurian and Ordovician shales are characterized by high oil-producing potential with a lower content of mineral matter. Cambrian samples are distinguished by both Py–GC and Rock–Eval analysis results, indicating their gas-prone character with a lower HI. Many authors note that the presence of mineral matter in oil shale influences significantly the pyrolysis reaction . In case of gas shale, this effect is believed to be even more important, as gas shale contains more inorganic material than oil shale. The minerals in gas shale are carbonates, silicates and sulphides (mainly pyrite). The minerals detected in the examined shale samples represent clay minerals (including chlorites), calcite, muscovite and pyrite. Significant correlation between lithology and organic content in the samples was not stated. From the viewpoint of decomposition of organic matter under inert gas conditions, the most interesting is the temperature range from 280 to about 600 °C, where the peaks reflect the release of gaseous components in the sample by pyrolysis process. The summary of the DTG curves for the selected samples (Fig. 5—reducing the number of samples in this figure was to increase the legibility of the diagram) allows to compare the range of temperatures in which the most intense changes (losses) occur during the pyrolysis reaction. According to Durand , a thermogravimetric analysis in an inert atmosphere allows the determination of three stages of organic matter decomposition. The first stage, to about 350 °C, is associated with the release of moisture and CO2 from the sample. In the second stage, up to about 500 °C, hydrocarbons are released. Above this temperature is the third step; the structural reconstruction of organic compounds is involved, without a significant loss of mass. The mass loss ratio during the first two steps allows the classification of kerogen. The larger loss of mass in the first stage indicates the oxygen-rich kerogen belonging to type III. Larger mass loss in the second stage of pyrolysis indicates a high hydrogen content, which is characteristic for kerogen type II. The above-mentioned effects are clear in the case of the analysis of the separated kerogen. For rocks with dispersed organic matter, as in the present study, the first peaks are not recorded. The second effect, as the strongest, is visible on the DSC curves and is also prominently displayed on the DTG curves due to the significant loss of mass. As it can be seen in Fig. 5, the maximum of the reaction of pyrolysis ranges from 450 to 584 °C, depending on the degree of maturity of the organic matter. 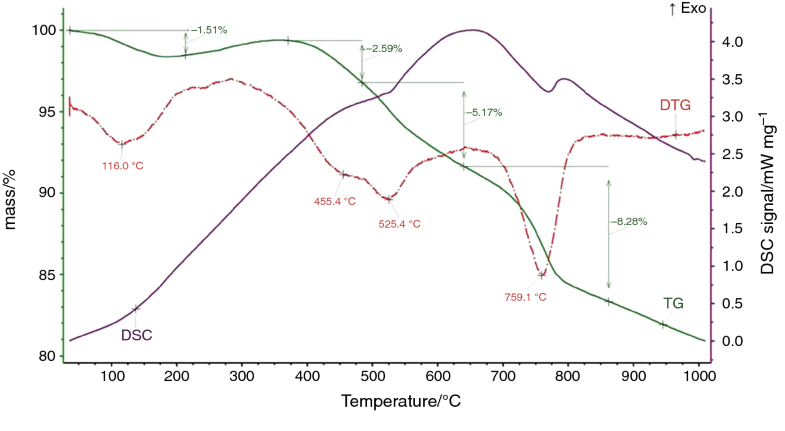 The increase in pyrolysis peak temperature indicates the thermal maturity of the kerogen in the sample . Therefore, sample 11 is of the highest degree of maturity. For most of the samples the pyrolysis reaction proceeds in two stages (see Table 2), whereas pyrolysis for sample 7 and 9 takes place in one step. In case of Cambrian samples, TG/DTG results show that the first pyrolysis stage (at the lower temperature range) is connected to the higher mass loss (Table 2). This observation is consistent with Py–GC data, indicating that the main products of pyrolysis of Cambrian rocks at the 400–650 °C range are light hydrocarbons of the C1–C9 fraction (Table 4). Also from Py–GC results, it is visible that the highest amount of light hydrocarbons (C1–C9) was released in the range over 500 °C for both Menilite shales, as well as Silurian and Ordovician rocks. These observations indicate the distinct character of Cambrian rocks. Thermogravimetric analysis (TG/DTG), coupled with DSC measurement, is a powerful device, complementary to Rock–Eval analysis, providing quantitative information on the organic matter present in the sample. To obtain valuable and repeatable results, the precise definition of the experiment conditions is needed. TG/DTG/DSC analysis enables detection of thermoreactive minerals in the samples, including clay minerals, carbonates (e.g. calcite), muscovite and sulphates (e.g. pyrite). Based on the Rock–Eval analysis results, kerogen in samples can be classified as type II. Additional information on the quality of pyrolysis products was obtained from the Py–GC analysis. Thanks to the combination of the all three implemented pyrolytic techniques, the quality of the generation potential of the source rocks can be evaluated in details. In some samples the oxidation and pyrolysis of organic matter occur in two stages, what is the evidence of the complex nature of the organic substance. The maximum of pyrolysis reaction is detected by TG/DTG measurement in the range of temperature from 450 to 580 °C, depending on the maturity of organic matter. The maturity level increases with the rock stratigraphic position. 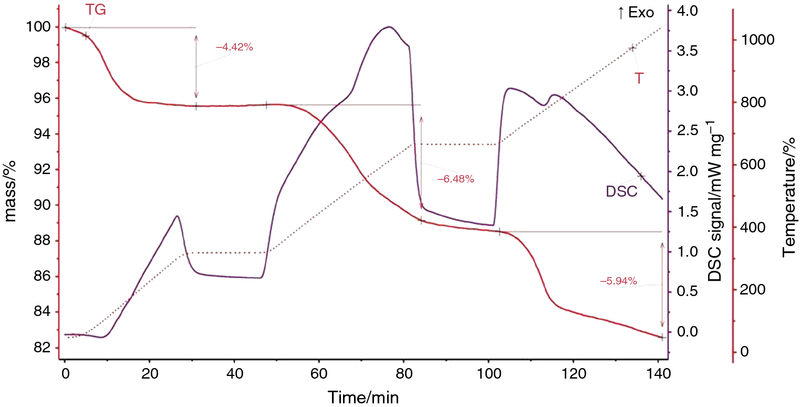 The proportions of loss in mass observed in respective stages of pyrolysis in course of TG/DTG experiment are in correspondence with the observations of the released fractions in the Py–GC analysis. The Carpathian Menilite shales could be classified as source rocks with high oil generation potential. Also, the Lower Silurian and Ordovician shales are characterized by high oil-producing potential with a lower content of mineral matter. Cambrian rocks show a different character, and gas-prone generation potential. This study was supported by the National Centre for Research and Development (Poland) in frames of Blue Gas Project No. BG1/MWSSSG/13—methodology to determine sweet spots based on geochemical, petrophysical and geomechanical properties in connection with correlation of laboratory tests with well logs and generation model 3D—DK-0601-6/13.